Glamping, which is a term that originated in the United Kingdom and blends together the words ‘glamor’ and ‘camping’ is becoming increasingly popular all around the world. It offers a lot of benefits, letting people appreciate the thrills of getting out in natural areas and enjoying the freedom of camping while also taking advantage of modern amenities and services like comfortable beds, running water, electricity, Wi-Fi, and more. Glamping is a great alternative to camping, providing the same fun experiences without any of the inconvenient sides like having to set up your own tent or try to get some rest in an uncomfortable sleeping bag. There are plenty of great locations to enjoy glamping around the United States, and the city of Moab in the state of Utah is definitely one of the best. Highly popular with outdoor enthusiasts of all kinds, especially those interested in hiking, climbing, and mountain biking, Moab is perfectly situated in close proximity to two major national parks: Arches and Canyonlands. The area around Moab is known for its distinctive, beautiful rock formations, and there are countless trails and natural sites to enjoy and discover. In short Moab is a prime spot for glamping and has a couple of great glamping sites to choose from. Glamping in Moab can be enjoyed at any time of year, as one of the best advantages of glamping is that your accommodation is safe against the elements, with warm beds and electricity at all times of year. The most popular times to visit are from early spring through to late fall, with temperatures during this period ranging from mild to very hot. The area doesn't see much rainfall through these months either, so it’s a great time to get outdoors and take in the beauty of the local parks and natural spaces. Glamping is growing in popularity and we can expect to see more and more glamping sites in Moab in the future. For now, there are two key locations to choose from if you’re looking to enjoy some glamping in this location. 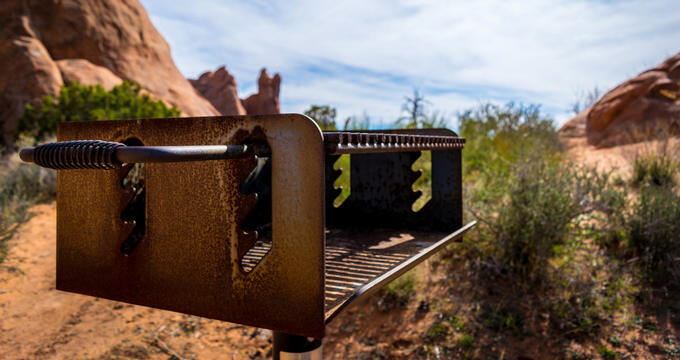 Read on to learn some key details and brief overviews of the best glamping locations in Moab, Utah. Right near the city of Moab is Dead Horse State Park. It's not quite as big as the nearby Arches and Canyonlands national parks, but it still has a lot to offer and is a beautiful spot to enjoy some Moab glamping. The Moenkopi Yurts offer an exciting, authentic way to enjoy the stunning scenery of this location. With dramatic views of the Canyonlands National Park and Colorado River, Dead Horse Point is a must-visit Moab location. There are five yurts in total for a truly private, intimate experience for you and your friends or family. These yurts are situated at high elevations that provide excellent views of the sunrise and sunsets in the area, and also come complete with private spurs to the Intrepid Trail System, offering the perfect base camp for your Moab outdoor adventures. Each yurt can house six people and comes with a bunk bed and futon. Outdoor grills allow you to cook up some tasty food and the yurts are also equipped with heating, air con, and electricity, with restrooms just a short walk away. One of the most popular and successful glamping providers in America, Under Canvas has locations in some of the most beautiful natural areas in the country and runs some of the finest glamping services you could hope to find. This company thoroughly understands why people are attracted to glamping and aims to provide the best experiences every time. Under Canvas Moab provides seven different glamping accommodation options to suit all groups and visitors. Some examples include Deluxe tents with private bathrooms, Safari tents with four twin beds for families and friends, Suites for luxury and comfort, and the option to add adjacent tipis for the kids to enjoy. Under Canvas accommodation is fitted with all the luxuries and amenities you need, including highly comfortable beds, sofas, showers, sinks, toilets, wood stoves, chairs, porch areas, and more, and you can find the perfect option for you and your party. As well as providing glamping accommodation in Moab, Under Canvas also runs glamping activities in the local area like rafting, horseback rides, zip line adventures, kayaking, canyon exploration, rock climbing, adventure tours, and more.